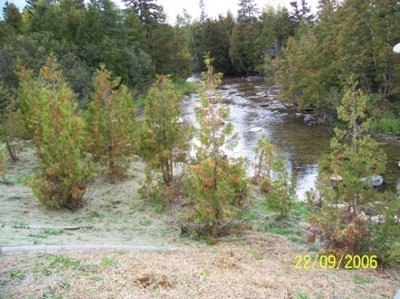 This community driven project was set out to improve the ecological diversity and productivity of the Manitou River. 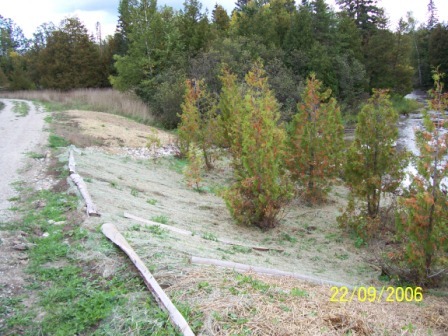 The work was completed according to the site plans through the cooperation of landowners, dedicated of volunteers, consulting expertise of Great Lakes Environmental Services (GLES) and equipment, material, and services of Lloyd & Sons Trucking Ltd. This project worked to create a stream channel that is narrower and deeper than the existing channel which subsequently increased the available resting, foraging and juvenile rearing habitat for the valued recreational sport fish of theManitouRiver(i.e. Chinook salmon, Coho salmon and Steelhead). 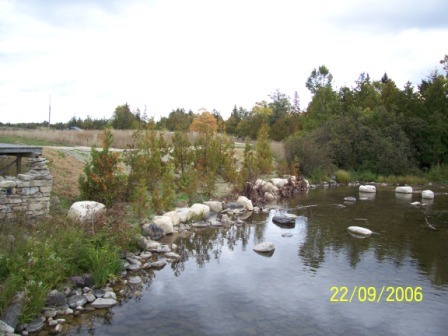 The undertaking involved, purchasing and installing 100 cubic meters of 600 mm boulders to mitigate shoreline erosion, the drilling of boulders to secure “sweeper log” fish habitat structures and planting native vegetation to establish a riparian buffer zone. Funds from COA and CFWIP were put towards purchasing materials for the rehabilitation of this site. Aquatic restoration work completed included the installation and strategic placement of 600mm boulders to channelize flow and prevent further scouring of the riverbank which subsequently leads to sedimentation of the riverbed. A number of rocks were installed to redirect and concentrate water flow. This in turn deepened the existing stream channel. Fish habitat features including root wads were also installed in the channel to increase resting, foraging, and rearing habitat for fish. This project was completed by restoring the riparian vegetation, which included the planting of eastern white cedar and white clover.